Bushcraft Survival – A razor sharp blade with a distinct tip, an all-weather Morakniv® Fire Starter and a Diamond Sharpener make the Bushcraft Survival the natural choice for those who love the great outdoors. The 3.2mm thick Swedish stainless steel blade stays sharp for a long time, is extremely tolerant against wear and has considerable cutting strength. The blade is ridgeground especially for use with the fire steel. The robust sheath is provided with a well thought out space for the firesteel and completed with a diamond sharpener, making it easy to sharpen the knife blade. An orange handle with high-friction grip gives the finishing touch to the Bushcraft Survival and is minimizing the risk to lose your knife. A knife that suits a tough livestyle! Razor sharp 3.2 mm thick Swedish stainless steel blade with a distinct tip. Purchase through PayPal by using the "Add To Cart" button above or use the form below to order the Mora Knives Bushcraft Orange Survival Heavy Duty . 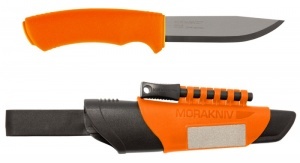 Feel free to contact us if you have any questions about the Mora Knives Bushcraft Orange Survival Heavy Duty .